LG is about to launch a new monitor that is one of the most feature-filled monitors on the market once it arrives. 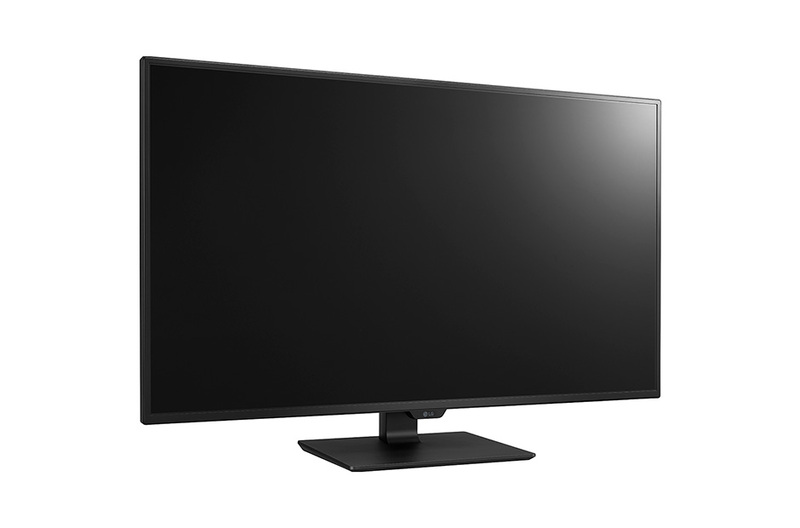 Referred to as the 43UD79-B, this 42.5-inch display has a native UHD resolution of 3840 x 2160 with a conventional refresh rate of 60Hz. It features an IPS panel with a non-glare coating, a peak brightness of 350 cd/m2, a contrast ratio of up to 1000:1, and an 8ms gray-to-gray (GTG) response time. The viewing angles are wide at 178°/178°, which is typical for an IPS display. Although support for 1.07 billion colors is claimed, the lack of an explicit mention of a 10-bit panel leads us to believe that this is an 8-bit panel using A-FRC to achieve a 10-bit color depth. On the plus side, this model will ship color calibrated from the factory. Assuming that the press release is indeed accurate, this model not only supports FreeSync variable refresh technology, but also a host of other gaming-oriented features like Game Mode, Black Stabilizer, and Dynamic Action Sync (DAS) Mode. The native 60Hz refresh rate will likely preclude this model from ever becoming a gamer favorite, but we are still glad to see that LG made an effort in catering to the gaming crowd. The peak refresh rate is likely 60 Hz for the Freesync, however LG does not specify the lower bound. Technically the specification sheet says 56-61Hz, although that is rather small for a FreeSync range. Also present is LG's Dual Controller feature, which essentially turns the monitor into a KVM switch. Users can plug a mouse and keyboard into the two downstream USB 3.0, install the Dual Controller software on two systems, and control both of them from that single mouse/keyboard combo. 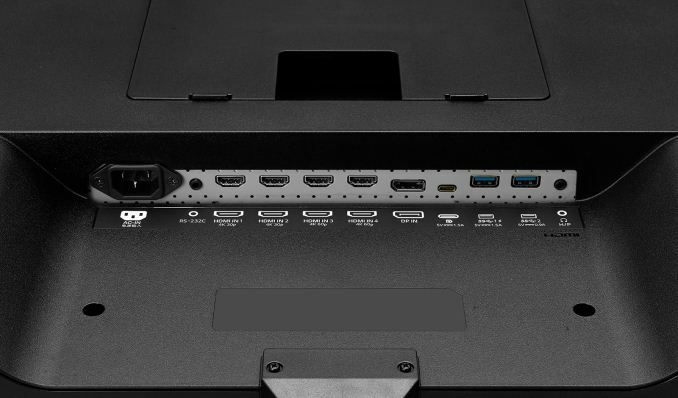 Rounding out the basic specifications are built-in 2x10W Harman Kardon stereo speakers, a headphone jack, an RS-232C connector, and a small remote control. The included stand is fairly basic in that it only allows tilt adjustments. While the press release indicates a countrywide Japanese launch on May 19th at a price of around 83,000 yen, US-based retailers are already offering preorders for $697 with an expected availability of May 9th. If that holds true, that is a very attractive price for a roughly 43-inch 4K monitor with that many built-in features and a three-year warranty. 27" area: 312 square inches. 40" area: 684 square inches. The width of a monitor is not the same as its diagonal size, which is used for the advertised size. A 16:9 27" display is 23.5 inches wide, and a 40" 16:9 display is 34.9 inches wide. This LG model appears to be the same panel given its specs, but has additional features such as KVM over the USB ports and 10W instead of 7W speakers. 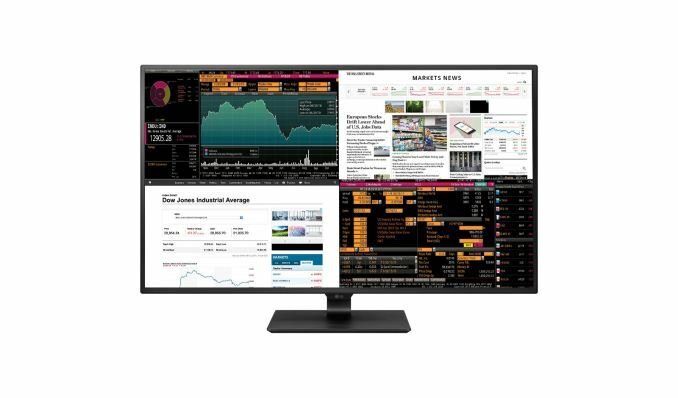 I bought this 43" 4k monitor after feedback from a colleague who specially bought a Sony 42" TV for use as a monitor, and he is right; It is comfortable to use as a large monitor. It is like having four 24" monitors without bezels between them. I bought it for 3D design because it gives me a viewing area which doesn't cross over a bezel and lets me zoom in on vertices to easily select them. Unlike a curved screen this flat panel means my lines appear straight. Yes, the sides of the screen don't point straight at me, but it also means I can view entire drop-down menus without scrolling. I had an expensive high quality adjustable VESA mount which I gave away after buying this monitor because I simply didn't need it anymore. It surprised me that the non-adjustable feet, which only lifted the monitor several cm's above my desk, turned out to be just right. In the past I have positioned monitors so the top of the viewable area is at eye-height to optimise ergonomics. Now, I find my eyes are only somewhat above centre but it works so well. Opening Microsoft Word on this monitor lets me display six A4 pages in larger than 100% of actual size, so long as I don't mind a little bit of each page cut-off at the top and bottom. It is great for comparing what I'm typing with what I typed a few pages ago. 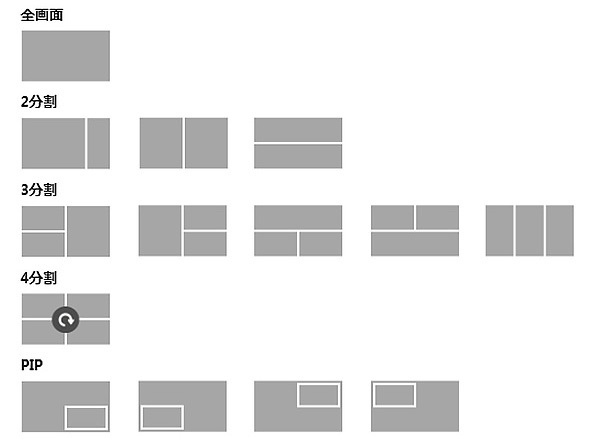 I can also scale pages up so large that I don't need glasses, and that's without pixelation. I can stretch a spreadsheet really wide on the top half, whilst working on another document on the bottom half, each effectively two monitors wide. Similarly I can have email on one side and the WWW open on the other, each two monitors high. For instance my boy likes to play Roblox on one side whilst watching youtube on the other side. "Fortunately, 34.9 is about 50% larger than 23.5, as well."